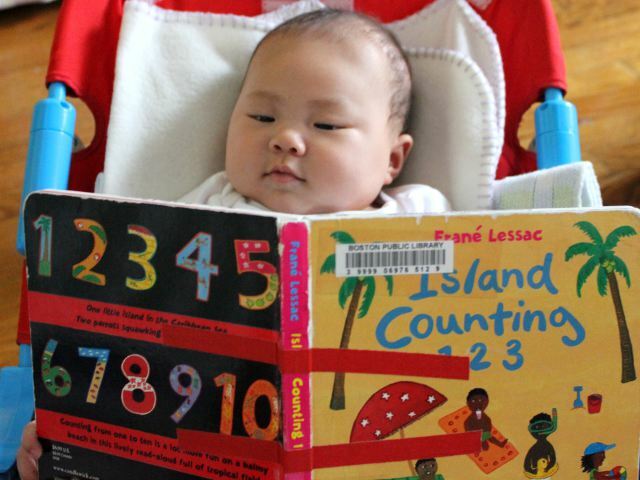 Through its 24 pages, Island Counting 1 2 3 dedicates two pages to each number from one to ten. Each pair of pages has a specific number of multiple items. For instance the page focused on the number “4″ has four donkeys, four baskets of corn, four white flowers, four clouds, four little trees, four weeds, a tree with four fruits, and a windmill with four arms. These pages also have a variety of colors including brown donkeys, white flowers, yellow fruit, green trees, purple sky, and black text against an orange background. The first time we read through the book I didn’t notice the extra items on each page. Since the text focuses on only one type of item–like the donkeys–it’s easy to miss the fact that many other items on the page come in the same quantity. Arya really like the pages dedicated to the number “7″. With seven colorful fish, seven umbrellas with different designs, and seven people playing on the beach she had plenty to look at. I liked the book as a whole because it teaches young kids to count in a fun and engaging way. Frane Lessac is a prolific author who has written dozens of children’s book. She has a great personal website with a full list of her books, art gallery, and even teacher’s notes for reading each book. Island Counting 1 2 3 and her other books based on Caribbean islands stems from her years spent on the island of Montserrat before she began her writing career. Island Counting 1 2 3 costs (including shipping) $6.99 new and $4.29 used from Amazon.